The 'Happy Camper' Felt/Plush Campfire Set for Kids. We are based in Vancouver B.C. 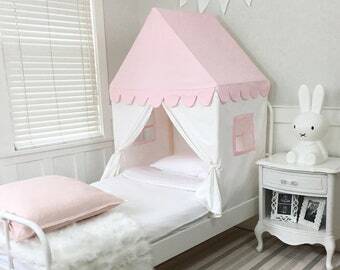 and Singapore and specialize in making beautiful and exceptionally well made teepee play tents for children. Be sure to check out our brand new playhouses! Singapore customers please go to http://www.Domestic-Objects.com for my locally available selection. We welcome wholesale orders. Contact me for more details. PRE-SALE: Kids Playhouse in Light Gray/Grey & White Soft Cotton Canvas. Storage Bag Included. I purchased this to help transition my 2.5 year old son from a crib to a bed. He absolutely loves it! He thinks it is a "fort" and loves to peep out from the window. I put it on a twin bed and the side of the tent acts as a natural barrier from him falling out of the bed. Beautifully made and very easy to put together. Fast shipping! The packing is so cute. very good seller. This brand new product just dropped in my shop. Meet the Play Tent Bed Header! We are beyond excited to announce our brand new Playhouse, in very limited quantities, is ready to ship. Two colours: Pink & Cream or Grey & White Stripe. Which is your favourite? Are you excited as us about the new Playhouse!? Now ready to ship! We're also cooking up some other exciting products this year! Sarah Jagger is a Vancouver Mom of two toddlers. She is the Mrs. Fix It of the household and can be found re tiling a bathroom, operating her miter saw installing crown moulding. She has been sewing all her life learning from her mother as a child. When she isn’t sewing machine she can be found running the seawall or traveling the world with 2 kids in tow in search of fabric, supplies and ideas to bring back her business Domestic Objects. She collects fabric from the countries that she visits with regular trips to Indonesia, the Philippines and Taiwan. Mom, Wife, Runner, Sewer, Do it yourselfer. Founder and CEO of Domestic Objects. Welcome to my store. All the items sold here are handmade and designed to inspire the imagination of children. There is a no return policy on anything custom made OR merchandise that is ON SALE. We will accept returns for non custom orders in NEW, unused condition within 14 days. Anything on sale is a final sale. Return shipping is responsibility of the customer. We are not responsible for any charges imposed on packages returned by Customs. You will receive a refund (minus shipping/customs) within 2 business days of the product arriving in new unused condition at Domestic Objects HQ. Please contact me to discuss. All items must be paid for before shipment. We accept credit cards, PayPal. Local Vancouver and Singapore pick up is available. Our in stock products will ship within 1-3 business days. Custom orders may take up to 4 week to ship depending on current stock and custom order load. Please message me for a timing estimate in the colour you like. I'll get back to you ASAP. Standard shipping takes 4-6 business days to arrive within Canada and the USA and up to 8 days for International orders. A tracking number will be provided for all USA and Canada orders. USA orders. You can use the same Canada Post tracking number in USPS once your item arrives in the USA for more detailed tracking information on the location of your parcel. International Orders: The same tracking number will work in your local postal services tracking system when it arrives in your country. Please message me if you would like a shipping upgrade or if you have a deadline that needs to be met. We will do our very best to get your item to you on time. If you are interested in bulk wholesale purchases, please message me. We accept custom orders, message me to discuss.